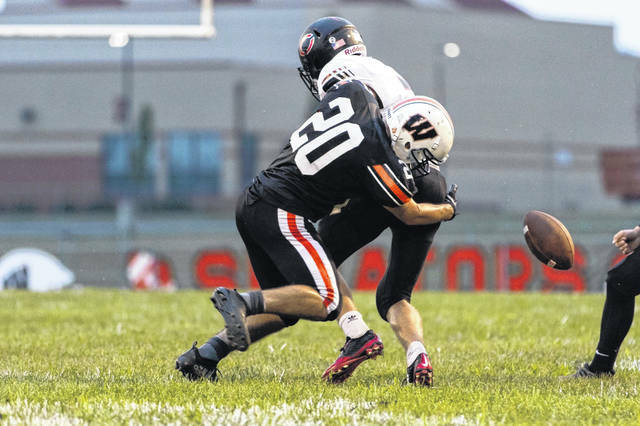 The West Senators improve to 3-0 following Friday nights victory over the Coal Grove Hornets. 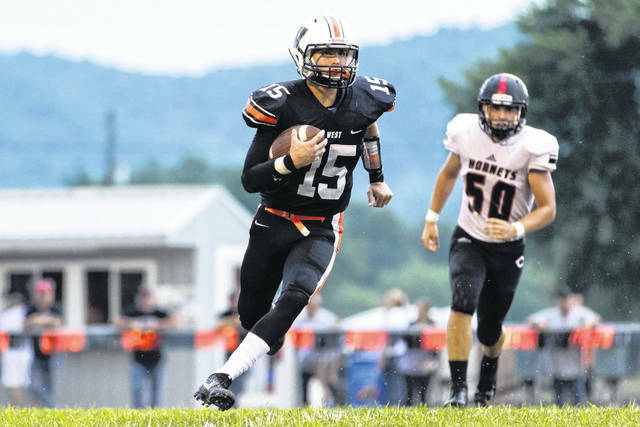 Senior quarterback Dylan Bradford had the game sealing interception in the final minutes of Friday’s victory against the Coal Grove Hornets. The Portsmouth West Senators defeated the Dawson Bryant Hornets by a final score of 21-14 in a game that will not soon be forgotten. The Senators were looking to stay undefeated on the season heading into the night’s matchup as they were set to play the defending OVC Champion, the Dawson Bryant Hornets. The game was shaping up to be a defensive fight as both offenses failed to gain any momentum. After forcing an opening drive punt, the Hornets offense, led by senior quarterback Nate Harmon, drove the ball into Senators territory. But in what would prove to be a theme of the first half, the Senators defense stepped up and made plays when it counted. Senior cornerback Joey Cyrus had a huge impact for the Senators in the first half as he broke up a touchdown pass that seemed as if it was destined for a score. Senators head coach Ben Johnson knew the Hornets looked to throw all night on Cyrus’ side of the field, but the senior stepped up and made big plays when they were needed. “He’s done an outstanding job, in that first half they were really trying to test him, and he stepped up to the challenge and made a huge play.” Not to be out done by his fellow upperclassman, senior linebacker Gabe Skaggs came up with a fumble recovery as the Hornets were looking to move the ball in for a score. With the game restarted, the second half would be a complete opposite game from the first half. Both offenses started moving the ball down the field as they traded one big play after another. Hornets quarterback Nate Harmon would score the games first points with a thirteen yard touchdown run on the opening drive of the second half. But just like the defense in the first half, the Senators offense would answer right back with a huge 65 yard touchdown pass from senior quarterback Dylan Bradford to senior Josh Berry on their very next offensive play. “After they had come out and got the score on us to take the lead, to just bounce right back immediately and get that score was huge,” said Coach Johnson. The score was again tied heading into the final quarter at 7-7. As the fourth quarter began, the Hornets looked to retake the lead on a long opening quarter drive. With the Hornets deep into Senators territory and threatening to score, the Senators defense would again come up with a huge stop as junior lineman Joe Igaz recovered a fumble on the twenty yard line for West. This turnover would lead to a huge drive by the Senators, capped off by a 21 yard touchdown run by senior running back Garret Hurd. After a missed extra point, the Senators had their first lead of the game at 13-7. The Senators would answer back with a 50 yard drive again capped off with a touchdown run by Garrett Hurd. Hurd’s second half performance would prove to be the difference maker for West as he rushed for 156 yards and two huge second half scores. With enough time on the clock, the Hornets were driving down the field when for the final time on the night, West’s defense stepped up when Bradford picked off a pass to give the Senators the win, 21-14 in the marathon game that lasted nearly five and a half hours. The Senators will be home once again in week four to host the Wellston Golden Rockets with kickoff slated for 7 p.m.